If you find it patriotic and uplifting to hold the Founders as the originators of liberal political theory, then I won't try to stop you. But if you're interested in actual history, you might want to read Hobbes' Leviathan, maybe read some Locke. Then go way, way back and look at the Magna Carta, where limitation of the monarch's power was explicitly spelled out half a millenium before 'the shot heard round the world'. The ideas of liberal governance were well established before the American Revolution, as a philosophical approach. The American Revolution was not so much the origin of an idea, as an implementation. And from my point of view, that's much more important. Ideas may at one time have been a 'dime a dozen', but I think you can get a whole pallet of great ideas today for a penny. Now, implementations, those are worth something. A democratic republic, in operation, that's really something. I see the American Revolution as a climax in a very long war against the old system of feudal vassalage and monarchy, one which started way back in England with the events leading up to Magna Carta and ended with the fall of the Romanovs and the surrender of the Emperor of Japan. Other than a few holdouts in the Middle East, the old system is gone. Please do remember that 'left' and 'right' factions were comrades in this long war, so don't forget what it was about. That's why I used the word "codified" and I believe I mentioned John Locke in an earlier article. I never said they originated the ideas that they used in the Declaration of Independence, Constitution or other documents - they did use their knowledge of world history, political and social history to "implement", as you say, this government we live under. 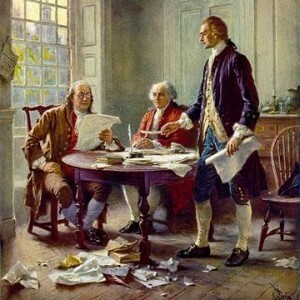 They were able to articulate clearly what the reasoning was behind the Revolution and later the Constitution. I am well aware of the history that led up to this point in our history (I did do a masters in Political Science) - but thank you for including it here since I did not. I would say that there are more holdouts than not - democracy is something that the entire Middle East doesn't understand, or China, or much of Africa, and depending on how things go in Russia - we'll have to see. The Arab Spring looks like it may go the way of one vote, one time - and digress into an Islamic way of life. What I was saying was that we see all of this as "self-evident" but truly is not to many.